The time is passing faster with every new day. I cannot believe three months have come and gone since we quit our jobs and started this whole shabang. Our last 10 days in Vietnam were split between lazy beach days in Mui Ne and eating whenever possible in Saigon. We got into a totally different pace in Mui Ne and we haven’t given it up since. We are sleeping in a lot more, reading in bed, taking long breakfasts (or brunches depending on how addictive our books are at the time). We’re sightseeing in the afternoons and avoiding the heat of the midday sun. Saigon was much the same except we replaced afternoon swims at the beach with afternoon walks in the city. I have to admit, I really didn’t like Saigon at first. I didn’t want to leave the serenity of Mui Ne, so the noise and congestion of Saigon was not all that welcoming at first. Then we started eating there and I totally changed my tune. Every meal we ate seemed to be the best meal we’d eaten in Vietnam. We ate so many varieties of soup and noodles and drank so much Vietnamese coffee, yet we always found room for a little bit more. It’s the thing we already miss most about Vietnam. It doesn’t feel possible that we’ve been here for 20 days. Each place we stop seems to somehow swallow up five our six days. 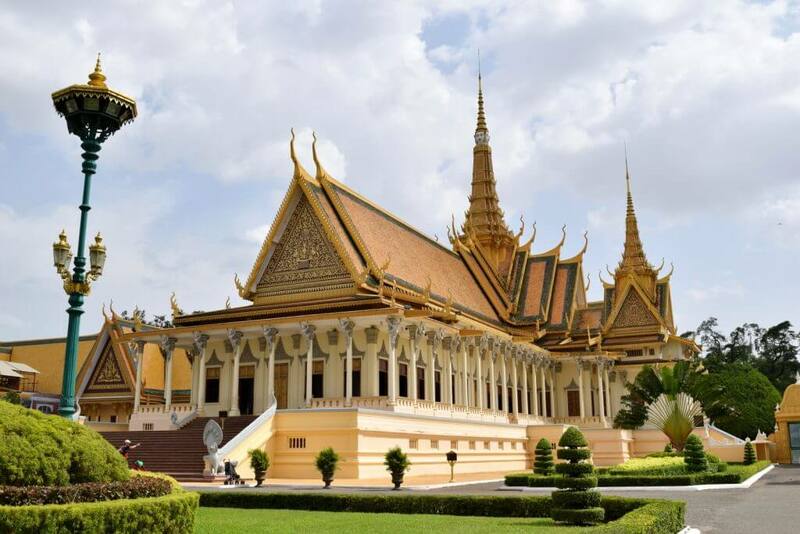 I really fell for Phnom Penh. We ate well, there was always something to see or good people watching to be had. We left after five days knowing that after a tour of the South we’d get to stop back through on our way North. Kampot is a sleepy little river town with cheap eateries and beautiful scenery. We rented bikes or mopeds everyday and explored the mountains and lakes. We took our time and enjoyed the peace and quiet and plenty of afternoon iced coffees. From Kampot we went straight to Koh Rong, an island off of the south coast. We opted to completely skip it’s well know landmate, Sihanoukville due mostly to its ruddy reputation. Koh Rong is the perfect mix of excitement and solitude. The small town, Koh Touch beach, where we’re situated has plenty or restaurants, bars and guesthouses to keep you occupied, but a walk in either direction brings you to completely empty beaches. The sunsets are stunners every night, the beers are cheap and the sun has shone it’s face every single day despite being the height of rainy season. All this eating out has really started to catch up to us. We’ve both suffered separately from some “tummy issues” that have really put a damper on a few of our days in Cambodia. Another ten days in Cambodia have been reserved for the far North East region of Ratanakiri and of course, Siem Reap. Then it’s onto Southern Thailand for 15 days of Bangkok and Beaches. It will be the last time we do any diving for a while, so we’re hoping to get about a weeks worth of underwater life under our belt before we have to leave.